A damning NHS Trust report completely vindicates what GMB has said about Carillion since the union was first approached by staff in 2011. GMB, the union for staff at Carillion at Great Western PFI Hospital in Swindon, commented on the report considered on 25th September by the Board of the NHS Foundation Trust which details significant concerns about the one star food hygiene rating, the cleanliness issues identified by the CQC last year and ongoing employee relations issues. GMB call on Carillion to heed this chorus of criticism from the NHS Trust and to talk to us to settle the dispute and get on with delivering the service they are paid to provide. The Trust is well aware of the industrial relations issues on site and must be concerned by the high number of discrimination claims lodged with the Employment Tribunal, which are damaging to the reputation of the Trust. The report drives a coach and horses through the notion that private companies such as Carillion should have any role to play in the health service and is a damning indictment of the Private Finance Initiative. Great Western Hospital in Swindon is just one of 150,000 properties around the world where Carillion provide facilities management and support services. Even if the top managers are very good they cannot properly look after that vast number of buildings. Carillion’s main aim from the very start has been to line their pockets with cash from Swindon Hospital. As soon as it can, the Trust should end its relationship with Carillion and take these services in house to be run by directly employed and properly accountable staff in the interests of patients and not in the interests of profit. 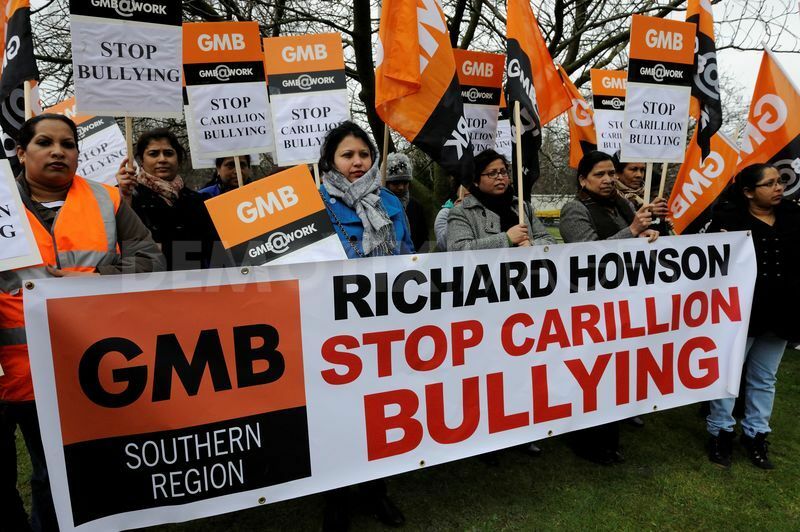 What we are seeing in Swindon is the same high-handed arrogance that gave rise to 224 construction workers from around the UK being blacklisted by Carillion. They have yet to apologise for this or compensate their victims”. This paper outlines a range of ongoing issues with Carillion which the Trust is increasingly concerned about in terms of the potential impact on patients, visitors and our staff. Whilst the paper details significant concerns about the one star food hygiene rating, the cleanliness issues identified by the CQC last year and ongoing employee relations issues, there are also a range of ‘hard FM’ issue the Trust continues to push Carillion to resolve. The paper sets out the key concerns the Trust has about Carillion’s ability to tackle these issues to ensure our patients, visitors and staff are receiving the highest quality service. Since December 2011, Carillion have been in an industrial relations dispute with a Trade Union following concerns raised by housekeeping staff about holiday entitlement, working practices and other allegations. This dispute has resulted in a large number (circa 50) employment tribunal claims lodged against Carillion by their own staff. This process is still ongoing with currently no timescale for resolution and it is clear distraction from the day to day service we require and pay for. The Trust does not hold a contract with Carillion. Instead, through the PFI, Carillion are contracted to provide these services by Semperian effectively the ‘owners’ of the building under the PFI agreement. This therefore means that Carillion’s failings are an issue not only for the Trust in how we protect patients and maintain the quality of patient care, but also for Semperian PPP Investment Partners who we pay for the hospital and to sub-contract the hard and soft FM services. The ongoing problems we have experienced with Carillion and their inability to resolve some of the more long running issues therefore reflect poorly on both Carillion itself and Semperian. The important point for the Board to focus on, is not simply this being a contractual issue between companies, but this is a fundamental issue of ensuring the quality of care and treatment we provide to patients is the best it can be. It is also a reputational issue for the Trust in so far as the continual issues with poor quality are adversely impacting on our reputation amongst patients and key stakeholders. Concerns about food hygiene and cleanliness, have posed a potential risk to patients, visitors and staff which is completely unacceptable. It is the view of the Executive Team that issues have not been taken as seriously as they should be by Carillion as resolving these outstanding issues is slow and any improvements made are not being consistently maintained. Despite senior meetings between the three main parties on these and other issues (the Trust, Carillion and Semperian PPP Investment Partners who contract Carillion) there remain serious concerns about Carillion’s ability to deliver services to the required standard. It is therefore increasingly frustrating and disappointing that serious issues regularly arise and the Trust now lacks the confidence in Carillion neither in being able to resolve these issues once and for all, nor in their ability to foresee and prevent other, as yet unknown issues, from impacting on patient services. For us, the absolute priority is patient care and we are unapologetic about expecting the highest standards of service from Carillion and swift action from Semperian – our patients expect it and the Board demands it. There is clearly a risk to quality and safety which needs to be addressed and Carillion have not demonstrated the ability to adequately resolve any one of these major issues to the required standard, let alone all of them together. The Board will be aware that the Trust periodically undertakes a formal benchmarking exercise which provides an opportunity to market test the service, however the benchmarking is due to take place in 2018 and therefore does not provide a more immediate solution. … … At the last meeting of the Board, it was resolved that legal advice would be taken to detail what options are available to us as a Trust. The Chief Executive of the Trust has also written to Semperian to ask what plans they have to rectify the situation but as yet we have not received an adequate response. The use of private companies to provide services in the NHS has been a significant failure, and the alleged greater efficiency of the private sector has been shown to be a complete myth. Posted in: Health, Rights at Work, Trade Unions. Why trust Labour to implement austerity when Tories do it with more conviction? No one seems to object to all the Labour local authorities who have Dr Faustus agreements with Carillion. It’s a case of vote Labour get Carillion. That is very far from the truth;there has been energetic opposition to Carillion (and other companies involved in blacklisting) being awarded further contracts, but obviously legacy contracts will need to be honoured. Well opposition yes but blacklisting is from the 1960’s so it taken long enough. PFI is a disaster for labour and Blair’s mob as it was for Thatchers lot. Legacy contracts? By way of example in August 2011 Tameside Trades Council wrote to the Labour leader of Tameside Council as to how it could justify entering into contracts with Carillion when it had been well documented in the case of Smith -v- Carillon earlier in 2011 that Carillon had accepted that they had blacklisted workers. I understand they never received a response. You just have to look on Google to see the ongoing relationship between Tameside Labour Council and Carillion. As recently as 12 December 2013 Tameside Council and Carillion reached agreements on Carillion sponsoring academy schools. But its not only about blacklisting, its also about the lack of democratic accountabilty when services are outsourced to the benefit of company shareholders.